No one picks out sea urchins like Colette. She’s got it down to an art. Picking them up delicately and with the slightest shake of the wrist, she weighs each one in her knowing hand. Oui, là, ils sont bien pleins (yes, these are nice and full). She says it with a sparkle in her eye as she throws them onto the scales. Full of eggs. That’s just what we want. We tell her we’ll be back to pick them up around noon, just in time for aperitif. She’s been there for over 30 years, Colette, working for the fishmonger on the corner of Rue des Abbesses and Rue Lepic (18th arrondissement of Paris, in Montmartre). She is the crustacean and shellfish expert, right on the corner. She sets up a beautiful stand with all sorts of goodies that vary according to the season and wallets of the of the client, mussels, oysters, live stone crabs, cockles, lobsters, langoustines, scallops The fishmonger has changed hands several times, but Colette’s been there faithfully, with all of them. And when she takes time off from Paris, she goes back to her native Normandy to work with a fishmonger there. Needless to say, she knows her stuff! I hear that the Japanese buy up most of the world’s sea urchins at a pretty price, so getting access to them isn’t always obvious. They are fairly expensive, but you don’t need a lot of them. They are very intense in flavor. A little goes a long way. 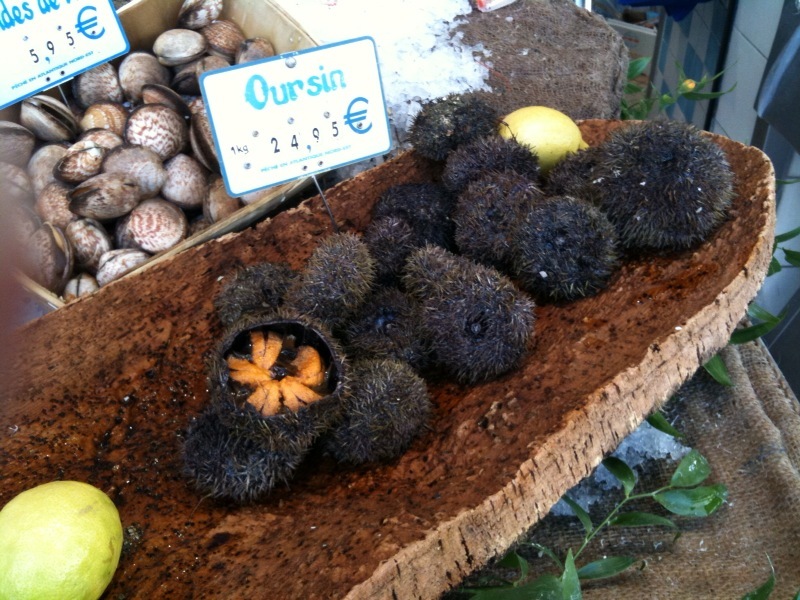 The sea urchins Colette sells either come from Iceland, Norway or the Atlantic coasts of Spain, for some reason. I think the little beasts like cold water. We tend to like the Icelandic ones best, they are more gingery and digestible and long on the palate. What’s fascinating about sea urchins is that no two have the same flavour! There are gamy ones –which I like the least- and there are sweet gingery ones. Red fruit ones, floral ones-the most intense ones I’ve ever had tasted like violet liquor! And every thing in between. The colors give hints as to what the flavors will be. The palest ones tend to be gingery, and the redder ones more meaty and fruity. We like to share them, one tongue of roe at a time from the same sea urchin, savoring every bite. It is very sensual. We open a bottle of good complex buttery but mineral chardonnay and life is good. Next Post Those Brittany boys…. I have read here before that some fish can handle red wine, and I agree with you. I’m curious about the gamier urchins – still with Chardonnay or could they handle a red? Funny you should ask. Last night I had sushi with sea urchin and it went with the Australian Cabernet Shiraz blend i was drinking. But I think that was from the bitterness of the sea-weed on the sushi. So I suppose we could talk about sea-urchin as a swing dish….and, as usual it depends on how it is prepared. Thank you for your response. Your site always leaves me feeling more educated and more inspired.